Are you looking to make a crowdfunding pitch video that hooks backers and helps successfully fund your campaign? Many crowdfunding experts agree that your crowdfunding pitch video is the most important part of a crowdfunding campaign. A well-crafted pitch video can be the difference between campaign success or failure. Your crowdfunding video is the first thing backers will look at, so if you don’t deliver your message correctly, it’s unlikely backers will stay around and look at the rest of your pitch. 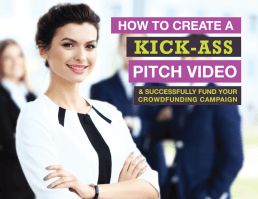 So, how can you create a successful crowdfunding pitch video? Well, we’ve tried to make it easy for you. We’ve taken our knowledge and experience of making successful crowdfunding videos and created a free guide that explains what you need to know when it comes to making your crowdfunding video. If you are serious about making a successful crowdfunding video to lead your campaign, to hook investors and deliver your message in a clear and concise way – helping to raise the money you need, then be sure to download this guide.